1. What evidence is there of a curse? Consider the malignancies roiling at Camp Green Lake. Consider Stanley’s ridiculously bad luck. Consider the pig-stealing great-great grandfather whom we’ll call the Pig Thief for short. See page 7 and 8 and Chapter 3 in general. See page 38. 2. When does the perception of a curse become a real curse or a self-fulfilling prophecy? 4. Consider the importance of promises to the story’s theme. Look, for example, at Stanley’s promise to write to his mother once a week. Also see the original promise (a failed one) on page 30. See page 46. 5. What is the association between water and hope in the story? See page 30. 6. How does Chapter 7 set the stage for the Yelnat’s family legacy and its curse? See page 37. 7. How is Madame Zeroni’s lesson on pages 30 and 31 a lesson for creating an antidote for learned helplessness? Also see pages 32 and 33. 8. What kind of society are we that we no longer value promises? 9. What evidence that Elya’s curse has affected Myra? See page 35. 10. Is there a parallel between Zero and the runt pig? See page 37. 11. In Chapter 10, how does Stanley’s struggle parallel the struggle of Elya? 12. How is the theme of literacy vs. learned helplessness introduced in Chapter 18, page 80? 14. Explain all the novel’s interlocking parts or puzzle pieces, like stinky feet, curses, literacy, poison, onions, promises, etc. (good essay topic) See Hector Zeroni on page 119. 15. What do onions represent? See page 109. 16. What is the scandal at Green Lake in Chapter 26 and how does it interlock with the idea of a curse? Also see Chapter 28 where the curse continues. 17. How does “God’s thumb” pertain to the story? See page 128. 18. What suggests an end to the curse in Chapter 32? See page 148. Accountability. 19. What opposites are presented in the novel? See Chapter 35, elixir of “sploosh” vs. poison of lizards. What are the implications of these opposites regarding human development? 20. How does Stanley’s newfound strength evidenced in Chapter 36 pertain to his great great grandfather? 21. Discuss the theme of the Grand Injury and our reaction to it resulting in progressive disease or progressive strength. See Erich Fromm’s book Escape from Freedom. Poison lizards are a metaphor for self-poison of self-pity, the thwarting of human life. It would seem that the amount of destructiveness to be found in individuals is proportionate to the amount to which expansiveness of life is curtailed. By this we do not refer to individual frustrations of this or that instinctive desire but to the thwarting of the whole life, the blockage of spontaneity of the growth and expression of man's sensuous, emotional, and intellectual capacities. Life has an inner dynamism of its own; it tends to grow, to be expressed, to be lived. It seems that if this tendency is thwarted the energy directed toward life undergoes a process of decomposition and changes into energies directed toward destruction. In other words: the drive for life and the drive for destruction are not mutually independent factors but are in a reversed interdependence. The more the drive toward life is thwarted, the stronger is the drive toward destruction; the more life is realized, the less is the strength of destructiveness. Destructiveness is the outcome of unlived life. Those individual and social conditions that make for suppression of life produce the passion for destruction that forms, so to speak, the reservoir from which the particular hostile tendencies--either against others or against oneself--are nourished. The novel’s title is fecund with meaning. 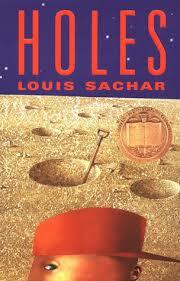 Holes refers to the wasted struggle people engage in when they’re pursuing false dreams or chimeras. Holes also refers to the wasted effort we expend on endeavors without having the proper knowledge or wisdom as a foundation. In a rush for instant results, we take what we think are short cuts and actually lose valuable time because any endeavor without the proper foundation is doomed to fail. Another meaning of Holes is the need to dig into the past and find missing pieces of a puzzle that make up our predicament so that we can get to the root of our problems and solve them. Digging holes is also symbolic of the journey into darkness in which we must go through the torment of hell before we can taste the delights of heaven. All of these meanings are evident in the novel. Dumb work is working toward a goal that is disconnected from who we really are and what we really want. When you don’t know what you really want in life, you end up chasing chimeras, a word for false dreams or mirages. A college friend had an older sister who got her medical degree and he was under pressure to impress his family. He became an accountant not understanding that he didn’t have the personality for corporate culture. Now he’s an alcoholic truck driver for Frito Lay. His accounting degree is toilet paper. A couple spends all their money on new clothes for the clubs and having “Chanel No. 5 Moments” together but behind closed doors they hate each others’ guts. Their lives are reduced to stringing along a bunch of Chanel No. 5 Moments. A couple doesn’t really want love; they like the idea of love. What they really want is their relationship to be a drama out of an MTV music video. As an example, my friend’s ex girlfriend chased him off a bus and pushed him into bushes and they both enjoyed it. They loved the drama, but they didn’t see that what they were doing is childish and lame. A couple gets married, not because they love each other, but because all their friends got married and they feel left out, they want wedding presents, and they want the credibility and instant adulthood status that a wedding provides them. Bling is a chimera or a false dream because it leaves a bigger and bigger hole. Every time you buy a bigger watch or car or house the emptiness gets bigger. Every time you shop for bling, you don’t sate your appetites, you actually stimulate them. This is called Feeding the Beast. Majoring in something purely for money with no interest in it is a way of digging yourself into a hole. Looking for a “perfect life”: perfect body, perfect partner, perfect health, perfect house, perfect car, and then being bored and disenchanted. George Bernard says there are two tragedies in life: not getting what we want and getting it. If you don't really want something, you're a faker, a poser. A student flunks my class, then returns 4 years later and gets an A because he knows what he must do to get an education. Eli Manning can't get a first down on fourth and inches because he doesn't dive. Instead, he tentatively shuffles forward and gains nothing. He's afraid to get down and dirty. Two. Holes is a metaphor for another kind of dumb work, the kind that results from not thinking ahead. In other words, technique and preparation save you time instead of going right into a project with tools that aren’t primed for the job or without knowing the correct techniques. In 2002 I was caught up in a vicious cycle of overeating and overtraining, the two feeding each other. Little did I know, I was in a cycle of bingeing and purging. Crash diets are hard and they don’t work. Over 98% of people who go on diets actually gain weight because they binge and mess up their metabolisms. Marathon training vs. consistent moderate exercise. Cramming the night before a test vs. studying moderately over a consistent period. When I was six years old fishing for bass in Bass Lake, I didn’t know how to use a fishing reel. When a bass bit the hook, I ran up the hill. I almost lost the fish. My father told me to hold the reel and wind it clockwise. If you saw or cut something with a dull blade because you’re too lazy to spend five minutes sharpening the blade, you end up spending 10 times as long cutting whatever it is you’re cutting or slicing or sawing. You’re too lazy to get your pants hemmed at the dry cleaners so you roll up the bottom and crease the hem and all day you have to bend over and cinch up your pants because they keep falling down and dragging on the ground. You end up spending 100 times more rolling up your pants than the fifteen minute trip to the dry cleaners. Daryl Gates went too far in his gang round-up in the early 1990s arresting a lot of innocent people during the sweeps. The LAPD lost the trust of the community and this created worse conditions for stopping crime. The LAPD was digging holes, as it were. Three. Holes is a metaphor for digging deep into the past to unearth the causes of your disconnections. Stanley Yelnats discovers that carrying Hector Zeroni (Zero), the descendent of Madame Zeroni, up the hill ends the curse from his great-great grandfather’s failure to carry Madame Zeroni up the hill. Sometimes we need to confront an issue from the past in order to forgive others, like the case of the missing cookies from my coat pocket in kindergarten. Four. Holes is a metaphor for going to deep into the darkness before you go find the light. In other words, we must go to hell before we can get to heaven. You can die a slow death being addicted to shopping, unhealthy relationships, drugs, alcohol, your cell phone or you can find a way to beat the addiction. But to beat an addiction, you have to go through withdrawals and face the demons that you tried to run from during your addiction so that initially you’re going to have to go through hell. We all have to dig holes in life. Not a thesis. This is more of an introductory sentence. It’s too general and has no mapping components. Holes has many different meanings. Again, this is too broad. Holes is a rich metaphor that refers to ___________________________, _________________________, ________________________________, and ____________________________________. This is better because we have a guide or a map for where we’re going in the essay. Many of us think of the phrase “digging ourselves into a hole” as a bad thing. 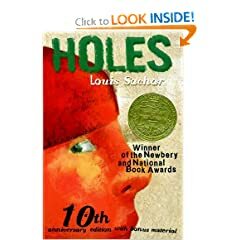 But the novel Holes shows the contrary, that the excruciating suffering of digging holes, metaphorically speaking, is an essential pathway to redemption. The hellish journey into the darkness of holes saves Stanley Yelnats and conversely ourselves because this journey has four positive outcomes, which include _____________________________, _______________________________, _________________________________, and ______________________________________. We could talk about the gradual strength Stanley enjoys from digging holes. We could talk about the family history he unearths. We could talk about the criminality he exposes in the warden. We could talk about the heroic image he uncovers in himself, as opposed to the wimp and the victim that he has been all his life. McMahon is fond of bloviating and rhapsodizing about the wonders of journeying into the darkness of holes, as if delving into our hellish past through whole-hearted introspection is some panacea that will save us from our cursed selves. But in fact, McMahon’s eagerness to have us unearth our dark secrets is both misguided and dangerous. For the type of introspection that results from the kind of “hole-digging” McMahon describes can often result in _________________________, _________________________, ___________________________, ________________________. This contrarian student might argue that introspection can often inflate or exaggerate our idea of our problems so that we feel overwhelmed and paralyzed by our problems. Secondly, this student might point out that not all investigations into the past result in the happy endings of this young adult novel. Some family secrets, when exposed, result in shame and disgrace, not salvation. Thirdly, this type of introspection can make us turn too much inward, resulting in narcissistic naval-gazing. Mr. Contrarian Student’s opposition to McMahon’s analysis of Holes collapses under the weight of a deliberate and malicious mischaracterization of McMahon’s definition of what it means to “journey into the darkness of holes.” For it is not narcissistic introspection, as Mr. Contrarian claims, but courageous exposure of unpleasant truths that are holding us back, that are keeping justice from being fulfilled, and that are impeding us from seeing ourselves unshackled by the lies we’ve been conditioned to tell ourselves. You can use the Holes Discussion Guide as a Research Resource. Definition: Learned helplessness is the paralysis that results when you convince yourself that you are helpless to overcome a predicament when in fact, objectively speaking, you have the means to solve your problem. For example, the baby elephant grows up chained to a pole and its owner eventually removes the chain but the elephant, as an adult, never leaves the pole because he’s convinced that he’s chained to it. A defeatist, pessimistic attitude that creates a self-fulfilling prophecy. A fear of maturing and defining yourself without the dependence on others. A determination to see yourself as a victim who has no control of what happens to you. Stupid enough to be weak but smart enough to manipulate others to bail you out every time. Three. What does the novel tell us about a cure for the curse that afflicts Stanley Yelnats and his family? We cannot overcome the curse instantly or overnight. To the contrary, ridding the curse is a gradual process. Stanley’s change is gradual. As he digs holes he gets stronger and stronger. Just like his great-great grandfather was getting stronger and stronger as he carried the piglet up the mountain. In other words, we have to take baby steps to remove a curse. We have to identify the problem. If we can’t see the problem, then we are beholden to it. Or if we refuse to identify the problem because such an identification hurts our ego, we remain enslaved to the problem. We have to embrace the fear of change over the stability of our personal hell. Some people prefer their private hell because they’re comforted by its familiarity and are more terrified by the prospect of change. I can’t emphasize this enough: Most people prefer their familiar hell to the fear of the unknown, even if the unknown contains the possibility and hope of change for a better life. Often a curse is reversed more by our character than it is by our actions. For example, even though Stanley is exhausted from digging holes, he fulfills his promise to his mother to write her letters and he fulfills his promise to help Zero learn to read. His actions reveal his character, which is based on loyalty, commitment, and fortitude (strength to endure). Four. How Much Should a Research Paper be in Your Own Writing? About 80% of the paper should be in your own writing. The other 20% should be direct quotations, paraphrase, and summary. Here is an incomplete list of verbs to use in order to avoid the lame trap of using "writes" or "says" every time. 2. Demonstrable means two things: writer has authentic emotional connection to material so he or she doesn’t run out of gas at the midway point. Secondly, it means writer can support the thesis with mapping statements. Sample: The popularity of SUVs reveals a malignancy about American consumerism. First, SUV makers market their vehicles toward people who wish to dominate and bully on the road; second, SUV drivers feel entitled to cheap gas to quench their driving habits, at the expense of American dependency on oil from hostile countries; third, SUV drivers often recklessly multi-task as they live inside their little cockpit fantasy. Lipstick, DVD, Carl’s Jr. gluttony, cell phone, etc. 3. A good thesis is often followed by a clarifying sentence: Owning an SUV is morally irresponsible. This grotesque lapse of morality is evidenced by _______________, ______________________, _______________________, and _______________________________. 4. A good thesis defies the obvious and possesses the So-What Factor: Sample: Tom Cruise and Terrell Owens are jerks. A better thesis: Society requires grotesque celebrities, such as Tom Cruise and Terrell Owens, to be our punching bags. First, these vile celebrities refute the unhealthy notion that riches result in goodness; second, our communal hatred for them gives us a sense of shared values; third, our loathing for these miscreants gives us catharsis and we vent our class envy and middle class frustrations. 5. A good thesis answers a compelling question. Why does no one care about Barry Bonds, even as he closes in on Hank Aaron’s record? In the wake of Hurricane Katrina, how did the US government leave so many people to die in a country that is the richest and freest in the world? Why do women continue to outnumber men in college enrollment? Another compelling question: Why do Americans spend more and more money on diets and workout programs and personal trainers as they continue to getter fatter and fatter and fatter and fatter? : Americans grow obscenely fatter in the face of their diet obsessions because none of their “programs” address the root of their fatness. To the contrary, their dieting exacerbates their real problem, which is that they are blind, incorrigible consumers. The diet is just another consumer commodity that promises a “magic bullet.” The diet is, like their overeating, a form of obsessive neurosis and orality. Finally, the diet becomes a form of shared communal experience that gives them a feeble sense of belonging and assuages their loneliness. Their laziness compels them to seek magic bullets rather than change behavior and get educated. Their diet obsession intensifies their food obsession. Their diet becomes a feeble way to stave off their loneliness. Holes is a grandiloquent novel about the arduous quest for redemption. This thesis is pretentious, full of big words, the word “grandiloquent” is irrelevant and the writer probably doesn’t even know what the word means but used it to sound pretentious. Worst of all, the thesis is too broad and fails to organize the essay with any kind of mapping components. Stanley Yelnats must counteract the curse that has afflicted not just him and his family but an entire community by changing his identity from a victim to a hero and in effect finding redemption for all the grieving parties. Stanley’s dramatic transformation is the result of _________________________, __________________________, ________________________, and ___________________________. The novel Holes is seething with the poison, contamination, and suffering brought upon by a Great Curse. This is a terrible thesis because it’s obvious and sets up an essay that will be a summary of the novel and summaries are boring. We can derive wisdom from Holes if we see how the novel defines the idea of curse in a radical light. Whereas the conventional idea of a curse is characterized by ___________________, ___________________, and ______________________, the more accurate definition rendered in the novel is distinguished by __________________________, __________________, and __________________________. The above thesis sets up a contrast essay in which the writer argues for a radical definition of the word curse. Holes shows us that all of us are fated to struggle with a curse. This is too factual, does not outline an essay, and is too broad. While most of us would surrender to the defeat of a curse as big in scope as the one rendered in Holes, the novel shows us that there is a way to overcome a family legacy of failure. To overcome a curse of the kind that Stanley Yelnats faces, we must, like Stanely, _______________________, ______________________, ________________________, and ___________________________. McMahon’s attempt to brainwash his students with Holes, a sentimental children’s fairytale, is misguided, sanctimonious, and annoying. McMahon would have us believe that we can all become like Stanley Yelnats if we exercise the compassion, courage, and integrity that this chubby youngster exhibits throughout the novel. That our lives would improve if we emulated Stanley’s behavior is self-evident and too obvious to bother writing about in an essay. In fact, McMahon errors in teaching us that the novel is about redemption and overcoming a curse because Stanley Yelnats was already redeemed at the novel’s onset. Therefore, no such redemption was necessary. Yelnats’ redemptive soul, which needs no transforming, is evidenced by ________________________, ______________________, ______________________________, and _________________________________. Mr. Student Contrarian attempts to pooh-pooh my analysis of the Stanley’s dramatic transformation by arguing that Stanley needs no transformation because he is at the novel’s onset brimming with virtue. But I disagree. A close analysis of the novel will show that the Stanley Yelnats at the beginning of the novel is vastly different from the Stanely Yelnats at the end. This dramatic change is evidenced by __________________________, _____________________________, ____________________________, and _______________________________. These final two thesis example, though in opposition to one another, are the best examples. Why? BECAUSE THEY ARE ARGUMENTATIVE. THE MORE ARGUMENTATIVE YOUR THESIS, THE MORE COMPELLING IT IS. Supernatural affliction that renders its victim helpless unless the curse is counteracted with equal or greater supernatural forces. There is nothing the werewolf can do during the full moon except transform into a violent Hairy Beast and wreak havoc on the community. Because the curse is overpowering, the victim is considered helpless and therefore has no moral imperative to do anything about the curse. A curse can be brought upon from supernatural powers, but rooted even more deeply than that, the curse is born from a moral failure, a betrayal, an unfulfilled promise. In other words, not fulfilling your potential does not merely result in a vacuum or an empty existence; it sets into motion the inversion of a good life and even worse a moral failure creates a curse that is passed down from one generation to another and another and so on until one person stands up and counteracts the curse with an act of defiance and courage. We are not helpless when we are beholden to the agonies of a curse. We have the tools to eradicate the curse from our lives. Not only do we have the tools or the means to eliminate the curse from our lives, it is our moral imperative to do so. Three. In the novel, what is the source of the curse and what do we learn about the nature of curses in general? The great great grandfather on page 38 leaves a cursed life for not fulfilling a promise. His hardships don’t just contaminate his existence. They contaminate the existence of his entire family, leaving a legacy of the Curse, passed down from one generation to another. We learn that curses can afflict us even if we don’t deserve to be afflicted with them. The bad behavior of one family member curses an entire family. Example #1: Parents raise two daughters who turn out okay, but the parents spoil their son who in his twenties doesn’t go to school or hold a job. He’s a petty drug dealer and his life has brought shame to the entire family. Shame on a family is a curse. Example #2: A college-age woman recognizes vanity in her family and relatives who put unhealthy emphasis on appearances, fashion, cars, etc. She sees the same vanity in herself and feels helpless to do anything about it and as a result she hates herself. She is cursed. Example #3: A young man recognizes that his father is stubborn and obdurate, which means unmoved by persuasion until it’s too late. The father and mother divorce mainly because of the father’s stubborn attitude, which results in chronic psychological abuse. The young man dislikes his father for stubborn quality but the young man has the same quality even though he doesn’t recognize it. The young man grows up to have the same relationship problems as his father. Thus we can conclude that the father has passed a curse down to the son. Example #4: Parents who divorce pass down a greater chance of divorce for their own children. Example #5: Parents who are alcoholics pass down their alcoholism to their children. Example #6: Parents with unhealthy eating habits pass their eating habits to their children who suffer from not just obesity but social problems, lower success rate in school and college, etc. This is a curse. Example #7: Parents who don’t value education pass this trait to their children who are less likely to go to college or succeed in college. This is a curse. Example #8: A boy grows up admiring his older brother who’s popular with the ladies. However, the older brother is a chauvinist who disrespects women and has learned to be a pathological liar in order to be a “player.” The younger brother grows up emulating this retarded version of masculinity. Hence, the younger brother is cursed. Example #9: A girl grows up admiring her older sister who learns how to manipulate men so that she can have her way. The younger sister emulates her older sister’s behavior and becomes an unpleasant, tyrannical manipulator. Hence, she is cursed. Example #10: A boy grows up with parents who see themselves as victims. Their whole existence is a giant pity party. The boy grows up identifying himself as a victim. He’s cursed. Example #11: A nation elects a President who is by all accounts unqualified for the position and this President lies to us in order to get us into a war that results in a catastrophic quagmire resulting in a 1.2 trillion dollar deficit, worldwide infamy, compromised military strength, profit-mongering for special interest groups getting fat cat contracts in the country we wrongly invaded, and the underpinnings of the Great Depression, Part II. This Wrong War is the Great Curse that hurts us, our children, and our children’s children and there seems no end to this nightmare. And to add to the insult of the Great Curse, its perpetrators get away with it facing absolutely no accountability. A curse is not just something that afflicts individuals; it afflicts entire communities and entire countries. Four. What curses exist in the novel Holes? Curse #1: Camp Green Lake used to be a lush community but not it is a dried-out wasteland roiling with evil tendencies, governed by an evil prison warden whose evil nature suffuses the environment evidenced by the poison lizards. Curse #2: Stanley’s family is poor; his father is an unsuccessful inventor; this is a legacy from the great-great grandfather. Curse #3: Stanley is overweight and kids tease him. He seems himself as a victim. Curse #4: A family joke blames the family’s “bad luck” on Stanley’s great-great pig-stealing grandfather, see page 7. Curse #5: Stanley is innocent of a crime he did not commit and the manner in which the tennis shoes fall into his lap prove that the curse is almost cosmic or supernatural in nature. Curse #6: The habit of blaming one’s bad fortune on someone else is sort of a curse in its own right because fatalism or learned helplessness, the belief that there is nothing we can do to improve our situation, is a sort of curse. See page 8. Curse #7: Zero suffers from illiteracy, the inability to read and write, which is a curse. Curse #8: Elya is warned that if he doesn’t fulfill his promise to carry the piglet up the mountain until it’s fully grown, he and his entire family will be cursed on page 31. Curse #9: Digging holes is a curse. The digging of holes represents blood, sweat, and tears amounting to nothing, a life of futility. This feeble life is juxtaposed to Elya’s curse on page 31. Curse #10 Zero was the “runt” in the way the pig was a runt that had to be fed in order to grow stronger. Starting at the bottom in life is often perceived as a curse. See page 37. Curse #11 A loving school teacher Miss Katherine falls in love with Sam the Onion Man. Sam is a black man, and it is forbidden in the racist society for her to love Sam. Sam is murdered and this not only curses Miss Katherine, turning her into a bitter outlaw; the curse devastates the whole town. See Chapter 26. Most of us, perhaps 95% or so, are cursed with the Two Great Afflictions. The first curse is explained by the narrator in Jim Harrison’s novel The Beast God Forgot to Invent when he begins his novel by saying “The human race pisses away its life on nonsense.” I have a student for example whose friend spends twelve hours a day chatting on Nike Talk. If you don’t like this metaphor, then look at this way: Since the beginning of time, the majority of the human race has been controlled by a small elite because the elite knows that the masses are blinded by their love of Bread and Circus, cheap food and entertainment. The Powerful Elite know that as long as they provide the masses with Bread and Circus they can control them. A modern day example of Circus, which is also a Curse, is American Idol. Hyped up on crystal meth, smarmy, self-congratulatory, sentimental, bombastic, and hopelessly juvenile, American Idol is the incarnation of the Ugly American Who Desperately Longs to be a Celebrity for a pathetic sense of self-worth. In this regard, American Idol is the Great Curse of modern times. In one page, define the radical idea of the curse in the novel Holes. Explain how the idea of a curse in the novel is different than the conventional idea of a curse. Then in two pages analyze the novel’s prescription for removing the curse. Finally, in another 2 pages, describe a personal struggle you had with a curse, as defined in the novel, and explain your success, or failure, with removing the shackles of this affliction or curse. Be sure to include 3 research sources in your paper. You can include material posted on this blog as research material. On a piece of paper write about a personal encounter, with yourself or someone you know, who was cursed and explain the outcome of that curse. The following orientation, what I tell English 1A students on the first day of class, applies to all my English 1A classes, WITH THE EXCEPTION of the 5-week Winter Semester, which is too brief for the 4 reading tests and the beloved Incentive Policy. Thank you for reading this disclaimer. Welcome, everyone, to freshman composition. I’ve been teaching this class for twenty-two years and I can tell you writing research papers is about as appealing to students as having to be fully conscious while undergoing liposuction. I see there are forty-five of you in here right now and, against the rules, I’ve added fifteen of you, and here’s why: For the last twenty-two years, without exception, forty-five to fifty percent of my English 1A students will drop the class. As soon as the first research paper is due, ten of you will have bailed. In some cases, it’s not just the weariness of having to complete the research papers that compels students to drop the class. It is also the dubious motivations that draw some students to be here in the first place. Some students are lonely and they enroll in college to meet people. Or some students are forced to go to college because their parents gave them an ultimatum, as my mother did to me when I was eighteen: Go to college or move out of the house. Or parents will tell their child to go to college so he can qualify for his parents' health insurance. While these motivations are understandable to some degree, they usually prove inadequate for keeping a student enrolled in class and doing the assigned work with the appropriate intellectual rigor. By the time the second research paper is due, another ten of you will have abandoned ship. I am confident that by the time everything has settled, we will have a class of twenty-five students, about five below the recommended limit. You are required to write four research papers, MLA format, about five to six pages in length, typed and double-spaced. You have to use headers, with the page number and your name in the upper right-hand corner of every page, include a Works Cited page, and integrate a minimum of four research sources into your essay. Eighty percent of the essay should be your own writing voice. About twenty percent will be quoted material. Of course, you can paraphrase and summarize from your research sources as well. I know you hate formatting your cited works, but there are Internet sites, such as Citation Machine and EasyBib, that pretty much do it for you. You choose MLA format, plug in the information, and the site formats the information for you, and then you cut and paste the entry onto your Works Cited Page. Your essays should have a sophisticated thesis that addresses the complexities of a topic pertaining to one of our readings. Your thesis should be argumentative. You should support your thesis with sharply defined reasons that are clearly organized throughout your essay. Your paragraphs should be coherent, detailed, and supported with compelling evidence. Additionally, your body paragraphs should be meaty, a good 120-150 words long. You will need an attention-getting introduction, some sort of salient personal anecdotage or other should do the trick. On the other hand, if you begin your first paragraph with the most stale and dreaded “In today’s society,” I will automatically flunk your paper as “In today’s society” is the most egregious essay opening in the history of freshman composition. You will also need a brief conclusion paragraph, essentially a dramatic restatement of your thesis. A good conclusion can be as short as one sentence long. But be warned: If you begin your conclusion paragraph with “In conclusion,” or worse, “As you can now clearly see,” you will automatically get an F grade. The former expression is a cliché, while the latter expression is condescending toward me, your reader. You don’t tell me what I can "now clearly see." I tell you. I’m in charge of what I think. I’m in control. So don’t insult your reader. And, yes, everyone, your reader is me. Now for a word about your manuscript. Make it polished and professional. Make sure you have adequate ink in your toner or cartridge. Make sure your pages are stapled in the upper left-hand corner and are arranged in the correct sequence. Here are some other manuscript pointers based on some embarrassments I’ve come across over the years: Make sure the pages are right-side up. Make sure your manuscript pages are not sullied by bacon grease, hardened cheese, or human detritus. When you turn in a greasy paper with the pages out of order or upside down, you’re making a powerful statement about yourself. And when I say powerful, I don’t mean positive. A final word about your essays. It’s up to you to choose a topic and an approach that you can get passionate about. It’s hard to fake a good paper. If you’re bored with your essay, your reader will be bored. If you don’t want a limp, soggy, brain-dead squirt of a paper, you need to have a fire in your gut for the topic. If you can’t muster a fiery passion for your subject, you might as well go home, watch TV and eat apple pie. Relax and indulge yourself because you’re not going to succeed in a writing class. If you can find a thesis you’re passionate about, gather relevant research, support your thesis with well developed paragraphs, and format everything according to the given protocols, you are more likely to succeed. Now writing four research papers, at 225 points maximum per paper, is ninety percent of your grade. But there’s another ten percent and that’s the four surprise closed-book reading tests, 25 maximum points each. I’ll ask you two questions from two randomly chosen readings and each question will need a detailed paragraph response, which will test your comprehension of the assigned reading. A good guideline is that each paragraph should be 150-200 words. If you’re not in class the day of the surprise reading test, too bad. You can’t make it up. You lose those points. If you miss one reading test, you’re grade will not diminish significantly. If you miss three or all four tests, then the chances are you have an attendance problem and your grade reflects your attendance problem. If you are a student with attendance problems—and I get a few in each class every semester—then you are a student who may want to drop this class. My class is not designed to cater to students with attendance problems, so if you're absent a lot, if you find yourself full of excuses for not turning in papers and for missing class, this class is not for you. Also if you think my policy of not making up reading tests is unfair, you would be well served to drop this class. Some of you are responsible students who object to the reading tests because they are a source of anxiety to you. Perhaps, but the alternative, which I have tried, is to not have surprise closed-book reading tests and the results were disastrous. Inevitably, only about three students who’ve done the reading show up to class and when ninety percent of the students haven’t read the assignment, the class is a major dud. Let’s face it. Most of us are motivated by fear. The fear and dread of failing a reading test makes us read the syllabus' assigned readings. Take the fear away and students won’t read. I was the same way. Most people are like this. We can conclude, then, that my surprise closed-book reading tests are rooted in a realistic view of human nature. As far as late papers go, I find I hate them with a passion and about the only generosity I can muster regarding late papers is this: You can turn in a late paper no more than two weeks after its due date and you will lose a full grade. Many of you want to turn in rewrites after I go through your paper with you. This is a problem because often students make corrections that I’ve made so that the rewrite is essentially me giving extra points for corrections I’ve already completed. If you wish to substantially change the substance of your essay, you are allowed to rewrite ONE ESSAY AND ONE ESSAY ONLY. One of the biggest challenges I have with students is Finals Week. There are a few students who do woefully bad work all semester, or no work at all, and then during Finals Week, they “find religion” and they want to turn in all their essays to me. Or for a higher grade they want to turn in a bunch of rewrites. Let’s make this very clear: NO REWRITES OR LATE PAPERS ACCEPTED DURING FINALS WEEK. Now a lot of these policies have addressed irresponsible behavior, or what I like to call predictors for failing student outcome. At the same time, I think we need to address those students who show predictors for success, specifically, we need a policy that rewards those students whose academic work evidences their hunger for excellence. To make sure these students aren’t lost in the shuffle, here is what I call the Incentive Policy: If you get A grades on your first three research papers and A grades on your four reading tests and miss no more than two classes, you will get an automatic A grade on your fourth research paper. That’s right. You will receive the maximum points for your final paper, which of course will insure an A grade in the class. This incentive is important because we need to encourage predictors for success as much as we need to discourage predictors for failure. If my writing philosophy, my grading scheme, and my mechanisms for encouraging success and discouraging failure are all agreeable to you, then please stay and we’ll begin the Struggle Toward Excellence together. A natural reaction to a curse is bitterness and nihilism, which means giving up on life. Reversing a curse is our way of achieving redemption, transforming our life in a radical way for the better. Example #7: Parents who don’t value education pass this trait to their children who are less likely to go to college or succeed in college. This is a curse. I had a student whose father resented her for going to college. Example #11: A man has a job he hates with a 2-hour commute from Torrance to Pasadena. After a ten-hour day and four hours of driving he can't face his family. He parks his car on the curb outside his house, listens to his wife scream at his three children and sips whiskey from a flask until he is numb enough to walk inside. Sometimes he never numbs himself sufficiently and falls asleep in his car, his face leaning on his steering wheel. In one or two pages, profile someone who has been cursed, which is to say write about someone who suffered misfortune, betrayal, or some other bad turn events and made their situation worse by succumbing to learned helplessness, bitterness, and despair. Then in a page show a similar curse in the novel Holes. Explain how the idea of a curse in the novel is different than the conventional idea of a curse. Then in two pages analyze the novel’s prescription for removing the curse. In one page, define the radical idea of the curse in the novel Holes. Explain how the idea of a curse in the novel is different than the conventional idea of a curse. Then in two pages analyze the novel’s prescription for removing the curse. This prescription will be your thesis section. Finally, in another 2 pages, describe a personal struggle you had with a curse, as defined in the novel, and explain your success, or failure, with removing the shackles of this affliction or curse. Write a 4-page research paper that analyzes the 4 major causes that help transform Stanley from a frightened soul languishing in learned helplessness and nihilism to a magnanimous soul full of self-reliance, hope, and redemption. Write a 4-page essay in which you explore the different meanings of the novel's title Holes. Be sure to support your assertions with examples from the novel. 1. Replace self-pity with empathy and duty to another human being the way Stanley helps Zero. 2. Don't try to accomplish the seemingly impossible in one big swoop. Rather, take baby steps and gradually improve your situation. For example, Stanley does not get strong and tough overnight. He gradually strengthens. 3. Fulfill your promises. For example, Stanley writes letters to his mother no matter how exhausted he is. 4. Have a strong vision of hope, like God's thumb in the sky, to give the tenacity and fortitude to achieve your goals. 5. Find strength and comfort from the knowledge that in life evil and poison are counteracted by greater forces of good. Similarly, the lizard's poison is counteracted by the power of onions, which represent love and healing. Analyze the novel’s title Holes as a metaphor that informs the novel’s major themes. Her name was Frankita Perez, a retired high school English teacher who had spent twenty-five years teaching “high-risk” students. In her mid-fifties, weighing over three hundred pounds and wearing nothing but white, freshly laundered muumuus, Frankita had a defiant chin and large dark brown eyes behind thick, black-framed glasses. Her hair was short, a black feathery bathing cap. She had a strained, raspy way of breathing. Most noticeable, she had no breasts, the result of a double mastectomy. She had never had cancer, however. Later, when I would become her boarder, she would explain that she had undergone the surgery so that she wouldn’t have to worry about the threat of breast cancer, even though there was no history of breast cancer in her family. Her dubious decision to have her breasts surgically removed should have been a clear warning sign that she had some sort of affliction, a curse brought upon by her own sense of victimization. I became aware of the precise nature of her curse one afternoon while I was doing my schoolwork inside her office. She let me use her oversized desk inside an office that was less functional and more of a storage room for all the junk that she had accumulated over the years. You could barely walk inside the office because there were stacked boxes of her teaching files, student papers, grade reports, letters from parents. She kept all of this paper work even though she had stopped teaching over five years ago. The desk itself almost had no room for me to do my college work. Stacked on her desk were stuffed animals and old photo albums, the leather covers worn and covered with mold. One afternoon, I could not focus on my studies. I kept looking at the photo albums aware that they might contain clues to Frankita’s past, clues that would explain how she had turned out to be the lonely, grotesque woman she was today. Maybe even Frankita had planted the photo albums and wanted me to open them and see for myself what had happened to her. Perhaps she desperately needed someone to understand the real her. And there it was before me. The story of her life in pictures. I opened the album. The photographs showed Frankita from infancy to the age of nineteen, showing her at her farm near Fresno. She was a beautiful young woman, her face glowing, her eyes wide with hope and wonder. With no blubber to obscure her delicate features, she was a stunning, slender girl, her eyes deep and soulful. Her hair was long and flowing past her back. Many of the photos, shot in the California central valley, showed orchards of plum and almond trees in the background, a veritable garden of Eden, which eventually Frankita would be expelled from. More photos revealed the culprit of Frankita’s demise. A man. What I first noticed about him was his strapping physique. Well-shaped muscles bulging out of his shirts. His chin always up in a pugilistic swagger. Some photos showed him engaging in “strong man” performances. One showed him lifting a jolly-faced three-hundred-pound man over his head. Another showed him picking up the back of a car from its rear fender while Frankita, sitting in the driver’s seat, appeared to be laughing hysterically. Then there were several close-up “sweetheart photos” of Frankita and this dark-haired man with sultry, assured eyes and an impish grin. Where was he today? Why hadn’t she married him? Why was she now unrecognizable? These questions weren’t answered just yet. But shortly after, during one of my snooping sessions, Frankita crept up behind me and gave me quite a scare. I thought she was going to reprimand me for going into her private things, but instead she sat down and told me the story about the man, Carlos, who had stolen her heart many years ago. He walked with a limp from a bullet wound he suffered after beating a man twice his size in an arm wrestling match, which took place late on night in a bar in Visalia. The man, the son of a rich pistachio farmer, was never even charged with the shooting and Carlos was banished from Visalia forever. It seems he tried to make up for his limp by becoming a man of great schemes and accomplishments. He had started a car repair shop, managed a cleaning and maid service, and had opened a profitable restaurant. Now with his savings, he was going to buy an orchard of orange trees and marry his childhood sweetheart Frankita. But near the wedding day it was revealed that Frankita was not the only love of his life. One evening when Carlos didn’t show up for a family dinner, Frankita searched for him and, on the tip of a friend, eventually found him on the edge of town inside a small shack. He was with a fifteen-year-old, a tiny elf of a girl. The scandal brought shame to Carlos and the girl who were forced to flee the community. They moved to Mexico in a house owned by some of Carlos’ distant relatives. Less than a week before her wedding with dreams of living with Carlos on an orange orchard, Frankita found herself alone, without any plan for her future. She had no education, no identity. She became full of rage and blamed not only Carlos and his family but her own family as well. They seemed content for Frankita to accept her fate and live the life of a lonely old maid, cooking their meals, caring for her nieces and nephews and relegating herself to the bottom of the family’s social rank. She would have none of it. She left town, got a job waiting tables in a large city, got her high school equivalency and eventually her college degrees so she could teach high school. As an award-winning high school teacher who specialized in “high-risk” children, Frankita became a prominent member of the community and seemed to enjoy how much she shocked her family who believed she would never amount to anything. That’s why she bought a new Cadillac every four years, to remind her family that she had made it, that she was in fact better than them. And when they called her crying about their financial problems, more often than not she received their requests with icy refusal. As she told me her rags to riches story, I kept looking at the beautiful nineteen-year-old just weeks before her scheduled wedding and it was painful to sit in the presence of Frankita’s current incarnation, a rasping, morbidly obese lady with no breasts, a cursed hag who rented out rooms to college-age bodybuilders who reminded her of the man who had betrayed her many, many years ago. Such a profound curse, resulting in learned helplessness, is evident in the novel Holes . . .
Five. What does the novel tell us about a cure for the curse that afflicts Stanley Yelnats and his family? Seven. Holes is a metaphor for another kind of dumb work, the kind that results from not thinking ahead. In other words, technique and preparation save you time instead of going right into a project with tools that aren’t primed for the job or without knowing the correct techniques. Eight. Holes is a metaphor for digging deep into the past to unearth the causes of your disconnections. Nine. Holes is a metaphor for going to deep into the darkness before you go find the light. In other words, we must go to hell before we can get to heaven.